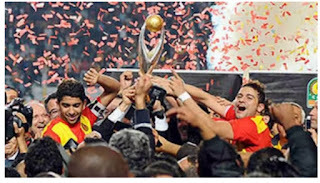 Esperance overturned a two goals deficit by convincingly trashing their much-fancied Egyptian opposition 3nil to lift te CAF champions league. Saad Bguir bag a brace to steerup the comeback against Al-Ahly. The Tunisians went on to claim their third Caf Champions League title, made all the more impressive since they experienced a difficult week after losing by two goals in Egypt. The goal came from excellent passing movements by the home side, that eventually resulted in Egypt international goalkeeper Mohamed el Shenawy facing an open Bguir and getting beaten from close range. Bguir made this opportunity count by striking it into the far corner of the net and giving hope to the Tunisian club. Bguir scored again in the second half to move Esperance ahead and cement his team’s advantage. A goal which was scored as a result of the overlapping work of full-back Sameh Derbali who crossed for Bguir to score another goal from close range. The result ensured Esperance smell their first CAFCL title since 2011, having won their maiden title in 1994.